We’ve all known people who only buy Hondas, others who swear by their Volvos, and those who proclaim their undying loyalty to Chevys or Fords. But for farmers, brand allegiance to a particular make of tractor is in their blood, which generally flows John Deere green or Farmall red. It’s an emotional tie to be sure, but also one based on any number of hard, measurable metrics. After all, when it comes to workhorse vehicles such as tractors, the dependability of the machine, or its lack, can make or break you. In fact, farm-equipment companies have a long tradition of earning their customers’ business, and affection, by demonstrating the tangible value of their machines. “More than a century ago,” says Lee Klancher, “manufacturers would hold reaping competitions. It was a major event in a community. All the farmers would come out to watch two new pieces of equipment harvest comparable sections of a field. Whoever did best got the sale. 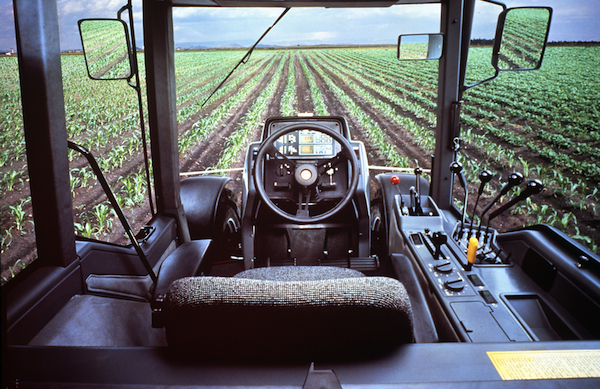 Above: The view from the cab of the Case IH Magnums of the late 1980s gave farmers unprecedented visibility and ergonomic access to the tractor’s numerous controls. Photo: Gregg Montgomery Collection. 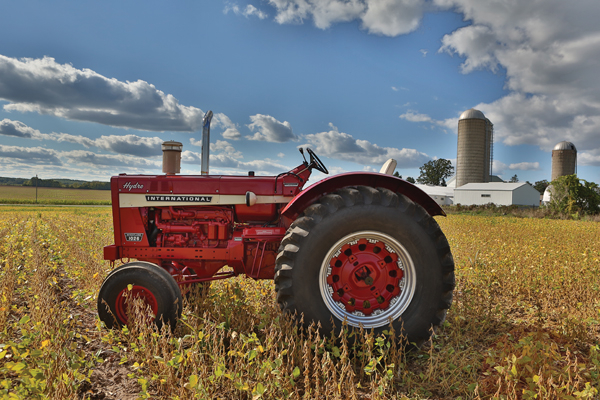 Top: Introduced in 1958, the Farmall 560 sported new, more powerful hydraulics. Collection: Jerry Mez. Photo: Lee Klancher. 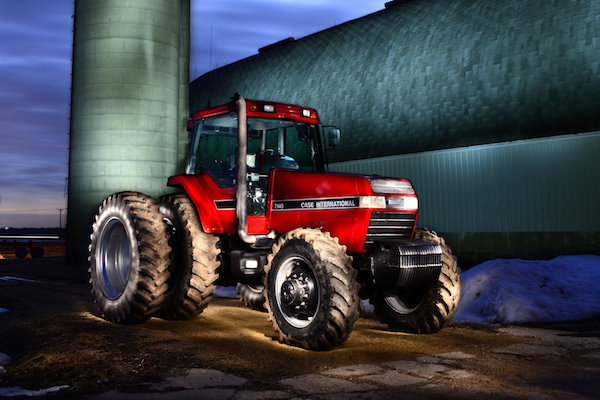 Lee Klancher has been a student of this market since 1992, when he first started photographing and writing about Farmall and other International Harvester tractors, which by then were sold under the name Case IH. This fall, Klancher’s coffee-table tome (he’s the lead author) was published, devoted to the company’s output since 1958, the year the firm entered its turbulent, modern era. Titled “Red Tractors: 1958-2013,” the 384-page, six-plus-pound book is an imposing work, almost requiring a tractor to lift it. 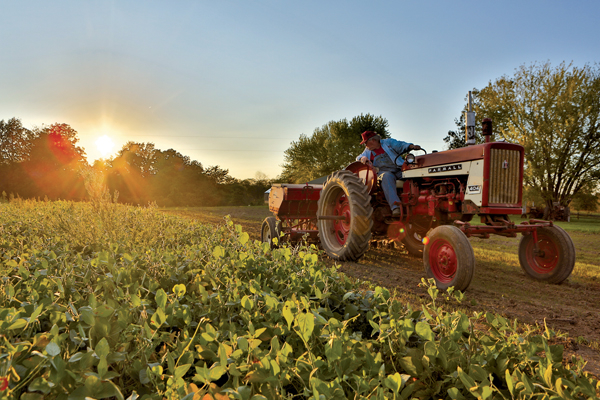 For Klancher, the arc from International Harvester Company in 1902 to Case IH in 1985 is not just the story of a tractor company: It’s a window on how the modern industrialization of farming has transformed the United States. 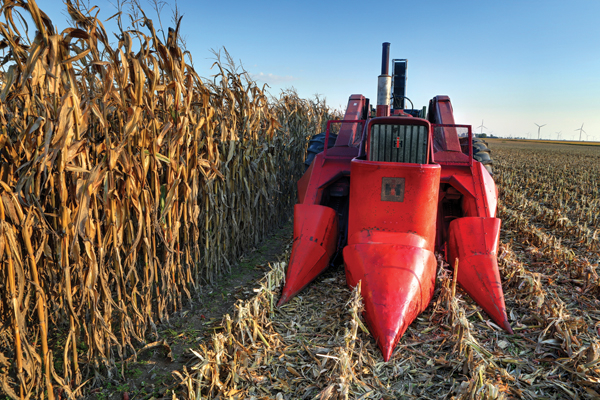 Tractors and the labor-saving farm implements they pull, from cultivators and seeders to reapers and balers, have changed the character of the country from coast to coast, thinning populations in rural regions while beefing them up in the cities and suburbs. The 1026 Wheatland was only made from 1970-1971; fewer than 2,000 were sold. Collection: Huber Brothers. Photo: Lee Klancher. Of course, just like those farmers whose blood runs red or green depending on their brand allegiance, it’s also a personal story. “My rural roots run pretty deep,” Klancher says. “My dad grew up near the tiny town of Willard, Wisconsin, and my family has a cabin and land there. That township is still 97 percent Slovenian, and for many years the only functioning business was my cousin’s bar. This wide-front Farmall 404 from the 1960s is still used for planting. Collection Darrell Darst. Photo: Lee Klancher. Still, as in all things, being in the right place at the right time doesn’t hurt, as Jerry Mez of Avoca, Iowa, knows. His father, Max, got into the farm-implement business in 1943. Before he and his wife, Joyce, sold their Case IH dealerships in 2008, Jerry had collected hundreds of old tractors. In 1991, the 7140 Magnum set a world record when Edgar Heyl of Hale, Germany, plowed 173.11 acres in 24 hours. Photo: Mark Jenson. 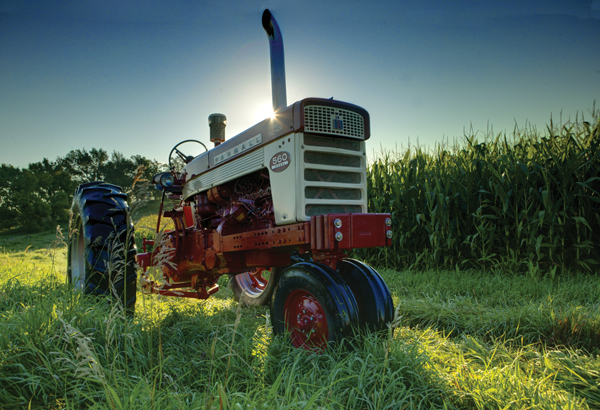 The IH 660 was a favorite of wheat farmers in the early 1960s. Collection: Huber Brothers. Photo: Lee Klancher. In the first half of the 20th century, about the only company to give IHC a run for its money was Ford, whose Fordson Model F of 1916 beat the IHC Moguls and Titans of the day on price, if not quality. “The Fords loved to poke sticks in the eyes of the McCormicks because Henry Ford’s little tractors were cheap. The first ones were not very good machines, but they were inexpensive and effective. The later Ford N-Series tractors made in 1939 were actually pretty good machines compared to the IHC stuff, which were big, clumsy, and expensive.” IHC corrected that, though, the very same year when it hired superstar industrial designer Raymond Loewy to redesign its profitable, but woefully out-of-date, Farmall line. The Letter Series tractors that followed (Farmall model names included the A, H, and M) went on to become the bestselling tractors ever. Despite the popularity of Loewy’s redesigned Farmalls, by 1958, when “Red Tractors” picks up the company’s story, IHC was heavily in debt and struggling with the effects of union strikes. By 1963, despite having a record year, IHC was forced to watch competitor John Deere eclipse the company in terms of sales and profits, thanks in part to the growing popularity of a new crop of 100-plus horsepower Deere tractors. It would take more than 20 years for Harvester to finally regain its footing, when, in 1985, it merged with yet another competitor, J.I. Case, to create Case IH (Case got prominence of position in the new brand, but Case IH tractors continued to be IH red rather than Case orange). “That’s when the company was reborn and started its comeback,” says Klancher. 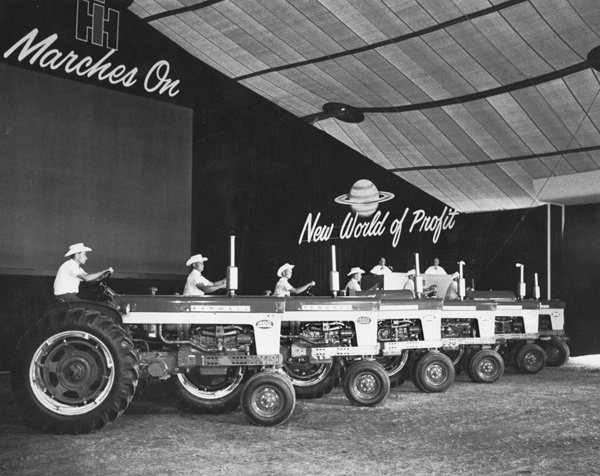 The 40 and 60 series tractors were introduced at the Hinsdale Farm in July, 1958. Photo: Wisconsin Historical Society. 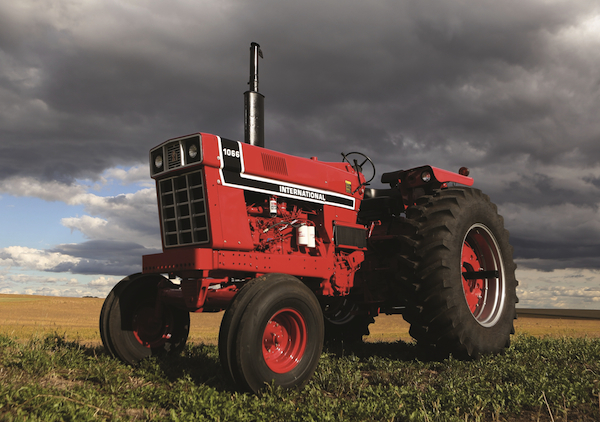 In 1976, the red on International Harvester tractors got redder, and the brand and model number was set off in a black racing stripe. Collection: John Olson. Photo: Lee Klancher. 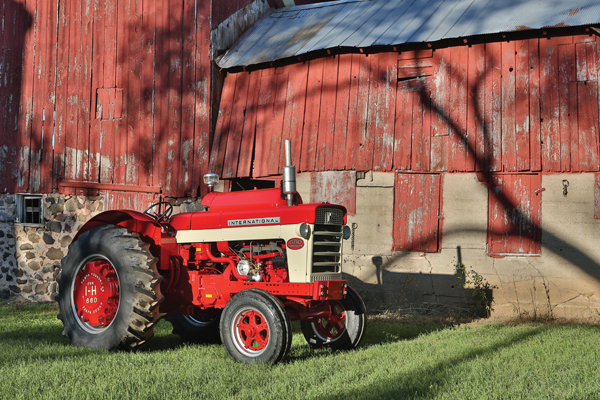 Hidden within this 1966 vintage two-row picker is a Farmall 706 tractor. Collection: Bill Dahlenburg. Photo: Lee Klancher. 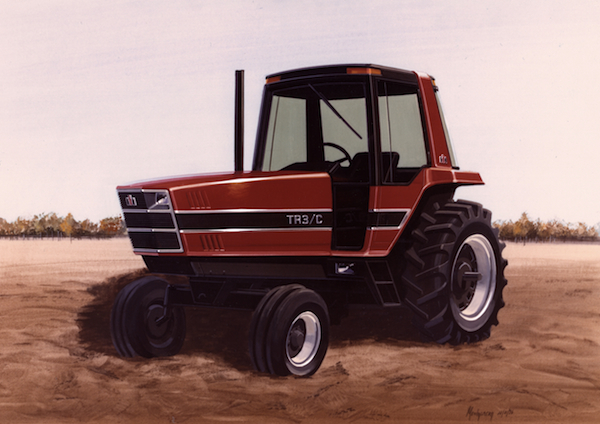 The 1976 tempera concept drawing for the 30 and 50 Series tractors by longtime IH designer Gregg Montgomery gave the machines a “Jetsons” look. Photo: Gregg Montgomery Collection. Nice cap on IH History. I recently ran across you article, Rise of the Machines ; Tractors and the End of Rural America. I was interested to see several of my designs included in this article such as the Black Stripe 66 series tractor, the first Case International Magnum tractor, the Magnum tractor interior design, and a concept rendering that was part of development process for a new generation of tractors code named TR4 series. The only one of these designs you credited to me or Montgomery Design International was the concept rendering which you suggest was actually a production version of an IH tractor which it definitely was not. The eventual outcome of this project was the IH 50 Series and 30 Series tractors which at that time I had design responsibility for as Manager of IH Industrial Design. You suggest that the enclosed hood was a result of a desire to make it look like a “spaceship” which is totally incorrect. Firstly, the “Jetsons-y” spaceship comment is rather insulting, and as stated above, that particular design was never manufactured so all of the supposed service issues you mention are totally irrelevant with regard to this design. If you meant to criticize the hood design of the IH50 series tractor, you might want to do a bit more homework before you begin publishing misrepresentations of the facts. The enclosed hood was a feature of a revolutionary forward air flow system developed by IH engineers not IH designers. Also with a little study you would have found that those panels had all daily service items routed to them for easy access, and the enclosed hood provided the quietest tractor on the market, preceding todays noise requirements by 20 years. The 50 series tractor was no more difficult to service than a comparable John Deere or any other tractor of that era, since they all required panels to be removed for major service work. I would suggest that before you publish a critique of a person’s or company’s work, that you either interview the person or company in question, or at least do the aforementioned homework. I would appreciate it if at some point you could publish some sort of clarification regarding these items, since your article paints a rather frivolous picture regarding serviceability, when nothing could be further from the truth. Which one has the fan shaft running directly through the radiator just so the fan blade can be positioned on the front side? Well, it’s what you should know, now a days it’s John Deere Green. For the reason of sentimentality I am still intriqued by the 86 series IH. Gotta give ’em respect, yessir. Mighty fine tractors accompanied by a very loyal following from back in the day. The 50 series is a great tractor if the 1980’s would have been better for the ag industry deere would have had there hands full with what IH had coming!! And Gregg Montgomery did a wonderful job styling the 50 series and 2+2’s!! Thanks Gregg ! THE INTERNATIONAL HARVESTER COMPANY; A HISTORY OF THE FOUNDING FAMILIES AND THEIR MACHINES.